Thirty four demonstrators were arrested peacefully Friday morning during an annual nuclear weapons protest at the Lawrence Livermore Laboratory. Keeping with a Good Friday protest tradition, some 100 to 150 protesters prayed and sang at the intersection of Vasco and Patterson Pass roads. Then they marched to the main gate of the lab and blocked it from about 8 to 10 a.m., said Don Johnston, a lab spokesman. The event was peaceful, and lab employees entered and exited the facility at two other entrances while the main gate was blocked, he said. The 34 demonstrators who chose to be arrested were cited and released, said Carolyn Scarr, program coordinator with the Berkeley-based Ecumenical Peace Institute. (NNSS). Ten were arrested in an often-repeated act of civil resistance standing for global nuclear abolition and Western Shoshone sovereignty in this region. The peaceful and prayerful demonstration included dozens of participants, with the final element of ten who crossed the line and were arrested by the Nye County Sheriffs and Wackenhut Security forces guarding the infamous nuclear testing grounds. The ten NDE participants arrested were Miki Tracy of WI, Rev. Felicia Parazaider of CA, Fr. Louie Vitale of CA, Laura-Marie Taylor of CA, John Amidon of Albany, NY, Theo Kayser of Los Angeles, CA, Erik Johnson of TN, Dennis DuVall of Prescott, AZ, and local Las Vegans Charlie Smith and Robert Majors. Two days prior to this prayer-action at the NNSS, on April 4, Vitale, DuVall, Parazaider and Majors were arrested at Creech Air Force Base after serving an indictment to Col. James Hecker for violations of human rights. The indictment focused on the killing of innocent civilians resulting from the use of drones controlled by Creech Air Force Base drone crews. The Passover/Easter weekend will continue with a reunion of former peace- campers from the 1980s gathering at the Peace Camp across US Highway 95 from the NNSS Mercury Exit. Five people were arrested at Lockheed Martin in Sunnyvale, California and detained at the Sunnyvale Police Department. After processing, Ed Ehmke, Mary Jane Parrine, Peggy Coleman, Rush Rehm, and Carol Broulette were released and told to appear in court on May 18. We all share the same planet, facing a somber choice in each of our lives to end our complicity with production of horrendous weapons of mass destruction. People gathered again at Lockheed Martin this past Good Friday as part of the Brandywine Peace Community’s continuing campaign of nonviolent direct action resistance to the world’s largest war profiteer (about $42 billion annually, that includes being U.S.’s #1 contractor in nuclear weapons – all weapons systems for that matter – space-based weapons and designs, among the top manufacturers of unmanned drones – armed drone weaponry, satellites for drone remote-control – #1 international arms dealer). Last fall, when the Occupy began in a massive, worldwide movement to openly challenge the reality behind the facts of economic injustice and Corporate America’s 1% Super Rich, we began to speak of Lockheed Martin as the Top-Gun of the 1%, a corporation that is the cross of war and violence for the very empire whose greed it so profitably protects at the expense of human life and community. As in our previous Good Friday demonstrations over the past four decades, we sought to remember and mourn humanity crucified today while claiming our cross of Jesus Christ today as a counter symbol of nonviolent resistance and hope. For us the traditional Good Friday observance of the “Stations of the Cross” has become “Stations of Justice & Peace.” On April 6, 2012, again, people gathered at noon on Good Friday, in front of Lockheed Martin in Valley Forge,PA, behind the King of Prussia Mall, one of the largest shopping malls in country. Each station was accompanied by a reading, or the audio broadcast of an excerpt of a sermon by Dr. Martin Luther King, Jr. (the anniversary of whose assassination we observed just two days before with a rally in front of the Phial Federal Building) or a song by Tom Mullian, and the planting in the ground of wooden crosses each with Lockheed Martin logos at the crucifixion nail points. Next to a much larger cross, on which an earth flag hung, people held banners and signs. At the 10th station – Jesus Dies on The Cross – our large bell of peace was rung as we stood in silence. As Adagio for Strings was broadcast, eleven of those gathered began standing with crosses in the main driveway entrance to Lockheed Martin, behind us stood a line of Upper Merion police and Lockheed security guards. We had decided that instead of immediately walking up to the “security” line, we would try to dispel a notion that our intention was “to simply get arrested.” So instead of immediately walking up the Lockheed drive, a group representative approached the security line and loudly announced that if we were allowed (even escorted) up to the company’s main doorway entrance, some distance from the driveway entrance, and allowed to do a short ten minute Good Friday and Passover prayer, we would leave the property forthwith. Lockheed Martin security chief would have none of it, even as our representative pressed our proposal repeatedly – at one point even asking that the general manager be called. The Lockheed security chief wouldn’t hear it, saying that she “couldn’t do anything”, except prevent us from bringing our prayer to the site and ordering arrests as all eleven people in the drive crossed onto “company property” began moving toward the security line. The eleven people arrested were: Fran Sheldon, Drexel Hill, PA; Mary Ellen Norpel, Ambler, PA; Tom Mullian, Wyncote, PA; Annie Geers, Media, PA; Father Patrick Sieber, OFM, Carroll Clay, Joseph Clay, Gene Cleaver, Bernadette Cronin-Geller, Mary Jo McArthur, and Robert M. Smith (staff, Brandywine Peace Community), all from Philadelphia, PA. They were each cited for Disorderly Conduct and released from the Upper Merion Police Station. War and the 1% Super Rich! “… ‘Our problems stem from our acceptance of this filthy, rotten system.’, said Dorothy Day, founder of the Catholic Worker movement. So our first acts of truth are ones first of realization and then of resistance. 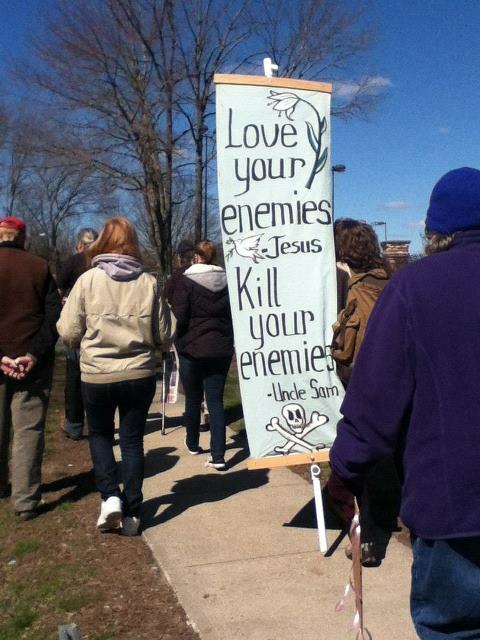 Five people, including a mother and son, were arrested after blocking traffic at the Groton Naval Submarine Base during a Good Friday Stations of the Cross procession. Cal Robertson, 66, Jackie Allen-Doucot, 50, Ammon Allen-Doucot, 17, Steve Kobasa, 64, and Brian Kavanagh, 68, were charged with obstruction of free passage. The five were released with a April 17 court date. Focusing on the theme: “Put Away the Sword–Follow Jesus in Nonviolent Revolution,” about 50 people from the Atlantic Life Community, the New Jerusalem Community in Philadelphia, Loras College in Iowa and other peacemakers gathered in Washington, D.C. from April 4-6 for the annual Holy Week Faith and Resistance retreat sponsored by Jonah House and Dorothy Day Catholic Worker. Remembering the Last Supper, arrest, torture, trial and crucifixion of Jesus, the retreat included time for prayer, reflection, community building and nonviolent public witness. To begin the retreat, Cathy Breen, a member of the Maryhouse Catholic Worker in NYC, offered a compelling talk and slide presentation about the plight of Iraqi refugees in Jordan and Syria since the US-led invasion of Iraq, and how being in Iraq with Voices in the Wilderness during the 2003 “Shock and Awe” bombing campaign changed her life forever. Recently returned from Jordan and Syria, Cathy reflected on the horrors of war and the seemingly insurmountable challenges facing Iraqi refugees in these countries, especially families, and also shared some of the ways she and others are helping them. She began and ended her talk with reflections on Martin Luther King Jr. as April 4 marked the 44th anniversary of King’s assassination. Following her talk, The New Jerusalem Community offered a powerful prayer/reflection about our need to continue to live in the spirit of Martin Luther King, Jr.
about delivering a copy of our statement to Embassy officials, the statement was accepted by an embassy security guard. On Holy Thursday evening a moving Liturgy was held centering on Jesus’ washing the disciples feet, the works of mercy and war, and the Eucharist. On Good Friday, the community engaged in public witness both at the Pentagon and the White House. 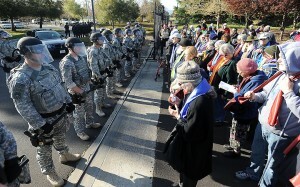 At 7:00 a.m. the community, held a “contemporary crucifixion” in a newly designated “protest zone” near the Pentagon metro entrance (see below the reflections that were read for each of the ten crucified victims as they, wearing black robes, took turns with arms outstretched on the cross). Simultaneously, on the sidewalk leading to the Pentagon metro entrance, eleven retreatants prayed in silence around a cross that had the inscription “Victims of War.” They also held a sign “Put Away the Sword,” and another sign that had the names of the 17 Afghan civilians who were massacred by US military violence on March 11th in the Kandahar province of Afghanistan. Chris Spicer tried to deliver a letter to Secretary of Defense (War) Panetta but was denied by police. After the third warning to leave the sidewalk or be arrested, Pentagon police arrested all eleven (see names below). They were charged with “Failure to comply with a lawful order,” and given a May 18th court date. At noon-time, the community, joined by other local peacemakers, repeated the contemporary crucifixion witness at the White House as hundreds of tourists looked on. Let us pray for each other during this most Holy Week, and for all those in our world who are experiencing now the passion and death of Jesus. And let us be transformed by the cross and resurrection of Jesus as we seek to practice resurrection and be living signs of hope for our world. We, members of the Atlantic Life Community, come to the Israeli Embassy today to stand with the “Women in Black” who witness at sites world-wide pleading for an end to wars between nations and civil wars within nations. Our presence in prayer speaks a loud and clear ” NO ” to planning, preparing for, or ever bombing Iran. We believe deeply in putting away the swords – all nuclear weapons – ours, yours and other countries’ – as total implementation of the Nuclear Non-Proliferation Treaty. We agree with Meir Dagan, your former chief of Mossad who has stated publicly, “bombing Iran is the stupidest idea ever heard.” We reject the position of Prime Minister Benjamin Netanyahu that more killing and destruction in Iran will build a Middle East at peace. We vigil here and pray for a change of hearts (our own included), and of Iranian President Ahmadinejad, Pime Minister Netanyahu and President Obama for understanding that the only way to peace is with peaceful means. On April 5th, Good Friday, Don Timmerman of the Casa Maria Catholic Worker Community in Milwaukee WI was arrested in Gesu Church on Marquette U. campus for refusing to leave the church with a sign, “Study War No More —Close the ROTC” during Good Friday services. He was charged with trespassing and refusing to leave a private building. He was part of a vigil in front of the church including the reciting of the Stations of the Cross with a huge cross with the words, “Close the ROTC —Stop Killing.” Twenty-five people attended the vigil. Don has a court date of May 30.